Yep, today’s my birthday. So I took this occasion to raid our cellar in Varinella for a little gathering last night. It wasn’t exactly a depletion party (that day awaits—and is sorely needed), but I did want to grab some older vintages that my husband normally guards like a growling three-headed Cerebus and uncork them with a few friends. My idea was to have a face-off of four top wines: Brunello, Barolo, Amarone, and Rioja. So, I popped an allergy pill and went down into the cantina to root around. We’re fortunate to have a real underground cellar. This part of the house is the oldest, probably dating back to the 13th century when the village was founded by monks. Its floors are dirt, it contains an ancient well (with water), an arched brick ceiling with hooks for hanging meat, a square cement fermentation vat in the corner from the 1950s, and our wine collection—about 300 to 400 bottles, very loosely organized by region and vintage. I went straight for the oldest vintages that we possess—the kinds of bottles we’ve been saving for a special occasion. “Like my birthday,” I coaxed Cerebus. We also had pecorino aged under walnut leaves and finocchiona (fennel-flecked sausage) from Tuscany, plus some divine cheeses that I brought back from Valtellina last week, including bitto, made only in summertime from the milk of cows who pastured in grassy alpine meadows. Then there was fruit, grissini, rye cracker-like rounds from Valtellina, and endless biscotti (the gift of choice). Just my kind of meal. All the wines were decanted. All were sipped and swirled by our friends—some wine freaks, some novices (yes, that’s possible in Italy). Then we voted on our favorite two. 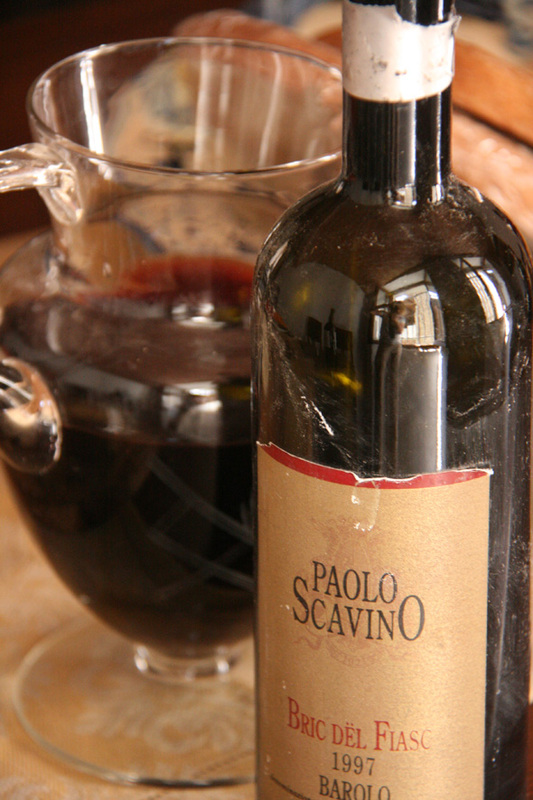 Who would believe that a Scavino Barolo cru from 1997 would actually come in last? Among Piedmont natives, no less! (Always a proud lot.) Actually, it tied with the Brunello (97pt WS). Neither got a single vote. And indeed, the Ciacci Brunello Reserve tasted a bit aspro, harsh and withholding. The Scavino showed some nice licorice notes, and I remember waving my hand in circles of appreciation. But both paled when compared to the Rioja and Amarone. Roda’s Rioja—a classic blend of tempranillo, garnacha, and graciano—seduced with succulent fruit, which was still lively and fresh. Its American oak was well integrated by now, so you were left of a beautifully balanced, polished wine. Roda has always been a favorite of mine, and this really sealed the deal. The Rioja got everyone’s second vote (except for one). Folks really fell hard for the Trabucchi Amarone, the hands-down first-place winner. And what’s not to love? Amarone is such a fascinating wine. On first impression, it registers as sweet in the mouth, with flavors of stewed cherry fruit, black fig, black raisin. But wait a second, and finishes dry. It’s like a parlor trick you want to see again…and again. That decanter of Trabucchi Amarone was depleted before you could say boo. The best part was this: Some of our friends had never tried Amarone before, let alone Rioja. Even though we live next door to a wine town (Gavi) and have friends who love wine, they don’t get many choices in their local wine shops that extend much beyond a 50-mile radius. For better or worse, Italians are still locavores when it comes to food and wine. So my greatest gift today was to spread the wealth of our cellar—and the bliss. What a difference a day makes. We revisited these wines the next night at dinner. The little Amarone that remained was still tops. (Why is it that more wine tourists don’t want to travel to the Veneto? I’ve never understood that lack of interest.) The Roda seemed oxidized. But to our delight, the two “losers” had undergone a beautiful transformation, like butterflies that had finally broken out of their cocoons and were displaying their full glory. The Barolo was now revealing all those tertiary aromas and flavors that come with age: licorice most notably, plus leather and balsamic notes. The Ciacci was a real surprise, with clove and dry spice coming through—aromas not even hinted at yesterday. These rode on the back of red fruit that was still bright and lively. Comparing 1997s, the sangiovese seemed fresher, the fruit still in its prime, while the Barolo was more evolved – the kind of Barolo that craves a dish with earthy porcini or white truffles. Bottom line: Even decanting a couple of hours before serving doesn’t do a complex, tight wine justice. They need even more time to find their voice. Next time, we’ll try a morning wake-up call.